The best horror movies with rats, both giant and small. Swarms of rodents, giant killer rats, and mutant super-rats: from Willard to Ben, and more. 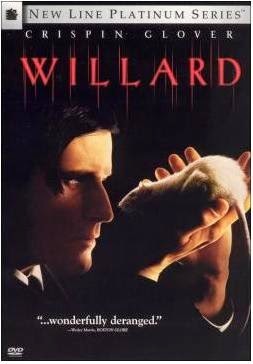 1 - Willard (1971) A young misfit man, Willard raises a couple of rats as his only friends - Ben and Socrates. Soon their rat friends also come to stay with him, in increasing numbers. Willard learns to communicate to the rat "army" through Ben, and uses his army of rats to attack and torment anyone who has caused him any grief over the years. When one of the rats is killed at work, Willard goes on a killing rampage with his army of rats. Things quickly get out of hand. 2 - Willard (2003) The remake is almost as good as the original. Stars Crispin Glover, whose acting exceeds and in some ways makes this remake even better than the original movie. 3 - Rats: Night of Terror (1984) A post-apocalyptic movie in which a band of scavengers enter a town infested by rats. It's like Mad Max with rodents. Italian film directed by Bruno Mattei. 4 - The Food of the Gods (1976) Friends hunting on a remote island find killer rats, and a lot more. 5 - Rat Scratch Fever (2011) A space expedition to a remote planet finds giant killer rats that kill the crew of the ship - all except for one survivor. She takes the ship back to Earth, but some of the rats are on-board, and they attack Los Angeles. 6 - Of Unknown Origin (1983) stars Petter Weller who faces a rat in his basement and nearly destroys his house and loses his own mind trying to kill it. Good psychological thriller. 7 - Graveyard Shift (1990) based on the Stephen King story, an old mill is hiding a big secret in its basement.... and she is big with sharp teeth! A giant rat and her swarm of kin aren't the only secrets hidden down there. 8 - Ben (1972) where Willard ended, Ben begins. Gritty sequel. 9 - Deadly Eyes (1982) oversized hungry rats are in the subway... and in the city. 10 - Rats (2003) aka "Killer Rats" an asylum is infested with super-smart rats, some with super powers. They communicate telepathically with the caretaker. It's a fun horror movie loaded with eye-glowing rats, starring Ron Perlman and Sara Downing. 11 - The Rats (2002) - a gang of evil rats take over a department store, and then set eyes on the city. 12 - Gnaw: Food of the Gods II (1986) A hormone serum causes rats to become huge. These giant rats now terrorize a campus. 13 - Rodentz, aka Altered Species (2003) A lab experiment gone wrong, now a swarm of rats is infected and on the loose. 14 - Nightmares (1987) was a collection of 4 short vignettes, and its final chapter is the "Night of the Rat" about a family facing off with a giant rat. 15 - Rat Man (1988) a mutant half-man half-rat.... very gory and very 80s. The Killer Shrews (1959) resembled rat-type creatures. Not sure what a shrew is, but these things looked like a cross between a rodent and a mop. Rats, mice,and rodents make for creepy actors in movies. Watch these rat movies with cheese popcorn, and a good trap; and keep your feet off the ground.